Your home is your sanctuary and you’re getting tired of the boring atmosphere you’re living in. The good news is that you don’t have to spend all your money re-decorating your home. Here are five simple tips to help you jazz up and snazzy up your living room. There’s absolutely nothing like a fresh coat of paint to brighten up and old, boring room. There are great paint techniques that you can apply to completely change the look and feel of the room. Remember to keep the color calm and make sure it matches your things. Give your living room a new look with quick, easy and inexpensive deco ideas. You can also go bold and daring by painting one wall dramatic and keeping the rest of the panels easy-going. Play with your furniture and position it in different places to get a “new look”. If you have a long living room and your furniture looks lost in it, try moving the couches into a U-shape to make it seem fuller and also create a cozier environment. A new painting and some candles will make a world of difference to a bland and boring room. There are many stores that offer affordable decorating goodies. If you can’t afford all the décor you want, buy it in small batches, and get your absolute must-have item first. There is so much you can do with a room without stretching your credit. Many stores have a lot of mix-and-match options that can be combined to create a crafty, trendy look. A new rug is a great way to change the look and feel of the room. It can also transform it from cold and open to warm and inviting. Put it under the coffee table in your living room for a great “homey” effect. 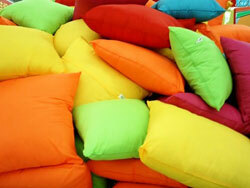 Cushions are relatively inexpensive and can really turn the room around. For added color get a matching couch throw and play with various styles. You’ll be amazed at the difference.